Welcome to Dressing the Bump Part II, where I'll be talking about the maternity clothes I bought and wore in the first half of my pregnancy. You can read Part I, where I talked about non-maternity clothes I've been wearing, here. Buying maternity clothes is not the easiest. First, you don't want to buy too many because you'll only be able to wear them a short amount of time. Second, the sizing can be weird. And the fit. Finding fitting maternity pieces has been pretty hit or miss for me, so I'm going to share some of my favorites and some of the things I tried and didn't work. Again, every pregnant body is different. This is just what has worked (or not) for me. In my last post, I said that you can pretty much get away with only buying basic t-shirts and tanks and wear them with cardigans for most of your pregnancy. Especially if you're pregnant during the cooler months. And it's true. The majority of my maternity tops are basic t-shirts and tanks. I do think that these items are pretty essential mostly because you'll outgrow your regular tees and tanks. That long tank top that used to come almost to your hips and cover your back? Not anymore! Here are my favorite tanks I've bought. I personally prefer v-neck tees, so that's what most of these will be, but they also come in different necklines. I picked this tee up from Motherhood Maternity on sale for $8. I wish I had bought more because they are amazing. They are a nice material, nice enough that you can wear them alone without a tank underneath or under a cardi or jacket. And they are long enough! I found a very similar top at Target under the Ingrid and Isabel line that was only $12.99. Either of these tops are great layering pieces. I have a black and a white and will be adding at least one more color too my collection. This was the first maternity top I bought for myself. I liked that it didn't look super maternity and that it had some fun detailing. This is a great top that you can wear in the early to mid-stages of pregnancy and after because the ruching isn't there. Also, it's only $22.99 which makes it totally worth it! I've also tried other tops in the Ingrid and Isabel line and they just don't work and I'm so sad about it! The line is so cute, but the fabric doesn't give and I either have gigantic arms or they assume everyone has sticks for arms. Either way, the rest of the tops, besides the one above and the tees, haven't worked out for me. Bummer. I also bought myself two work tees from Motherhood that are a super soft cotton texture with 3/4 length sleeves. I have the above top in black and white. I got it on clearance at Motherhood (I'm not trying to spend a ton of money here). These are great work tops because they're comfortable and easy to layer with a jacket or a cardi when you need to look a little more put together. I have two like this and I rotate them every week. They're very versatile and comfy enough to be worn on the weekend too. Jeans have been the worst thing for me to find. The first few weeks, maybe months even, you can do the hair tie trick. 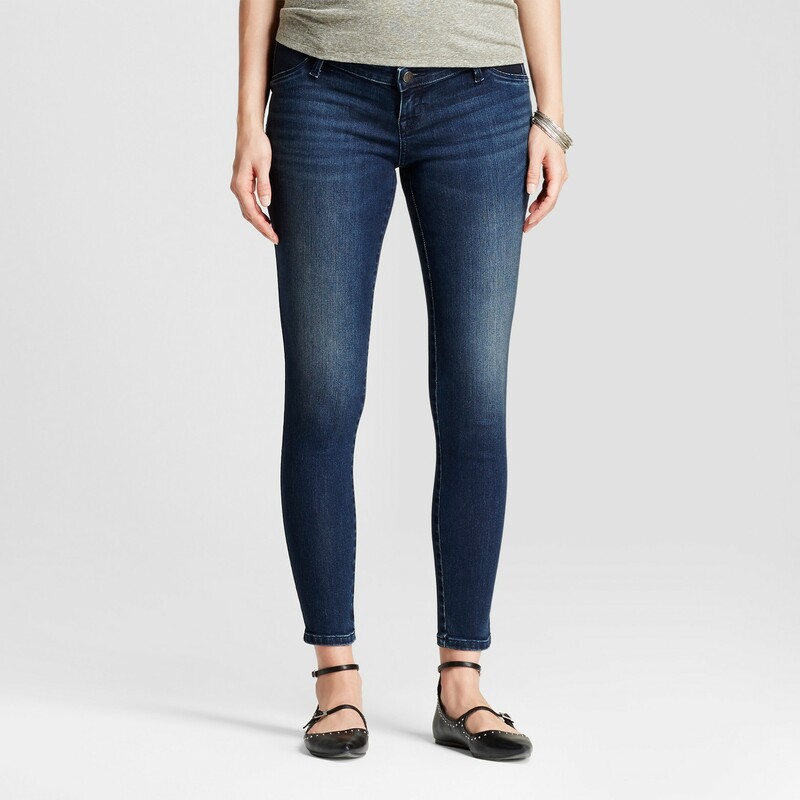 This allows you to stay in your jeans and not have to buy maternity jeans immediately. This worked for up until about 10-12 weeks. I don't wear low-cut jeans. I wear jeans that hit right below my belly button, so once they hit about one to two inches from being able to close, I gave up the hair tie. I tried a belly band. I hate the belly band. Others swear by it and, if you can make it work, that is awesome for you. But I hate it. My pants would need to be adjusted every time I sat down or got up, then I'd have to adjust the belly band, then my jeans and even then it didn't feel right. Half the time, I felt that they were sliding down me worse than maternity jeans! So, this post will not give you a bellyband because I have yet to find one I don't hate. Maternity jeans. It has teaken me a while to figure this out, but I feel like a semi-expert now. I have four pairs of jeans. Two full panel, one with inserts and one demi panel. Here's my hard-earned experience. You are welcome. Until you get a full pregnant belly (I'm just now starting to get there), the full panel is going to be useless and those jeans are going to wiggle down your body non-stop. Either the demi panel or jeans with inserts are going to be your best bet. Unfortunately, these bands cut right in the middle of your tummy, so they will give you a bit of a fat roll or muffin top. Just stick with looser tops and cardis and you'll be fine. For me, comfort and not pulling my pants up every five steps was worth wearing a looser top. These are the two I own and love. These were my first pair of maternity pants (bought with the pink top above). I wasn't ready for the full panel yet, but the hair tie wasn't working, so I went for these. There are elastic inset panels at the waist, allowing the jeggings to grow with you. I'm a size 12 and got these in a size 12. They still fit, but are a little more snug than they were before! Gap jeans are the best maternity jeans. These babies don't budge, they stay in place all day without me having to yank them up once. It's honestly a big of a miracle. I sized up to a 14 in these jeans since Gap runs a little smaller on me than other brands. I bought these on sale with multiple discounts and rewards and ended up only paying $15 out of pocket for them. I love them so much, I just ordered a second pair! 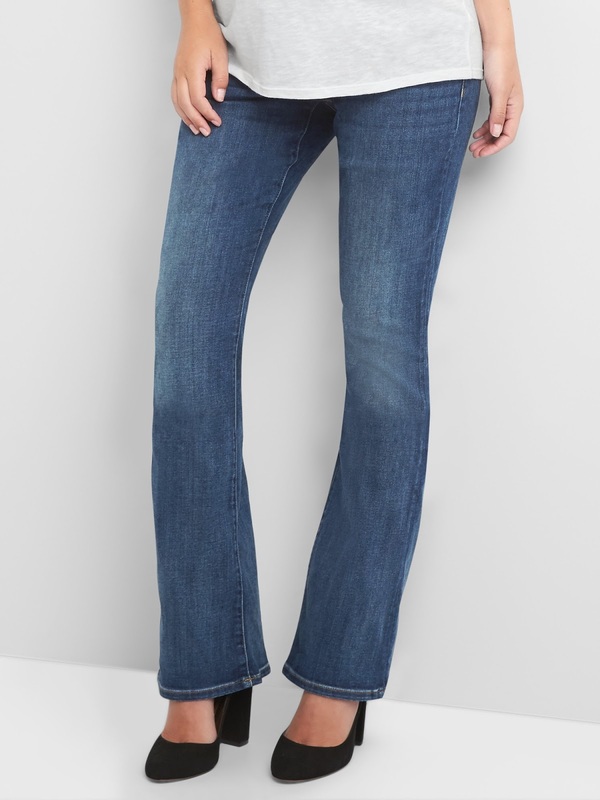 Loft has been my favorite brand for jeans for a long time, so when I was having trouble finding jeans that fit and stayed in place, I looked for maternity jeans there. I actually found my pair on Poshmark. They are this same rinse, which is great for work, but they are bootcut. I didn't find the exact same pair online, but their jeans all fit about the same, to me. I have a 12 in these jeans and they fit perfectly! They slid a little in the beginning, not nearly as bad as the Motherhood Maternity jeans. Now that my belly is fuller, they are fitting perfectly and not slipping at all! I said in my last post that you could probably get by with mostly wearing stretchy skirts and dresses. And it's true, you can. But deep down, I'm a pants girl. I've bought three pairs of maternity work pants and two of them were from a consignment sale. One was a pair of black slacks from Gap and one was a pair of gray with light pink pinstripes from Liz Lange. I think I paid $15 for them together and they've been a great addition. However, my ultimate favorite pants are from Loft. And they are the same style as my regular pair of work pants. The Riviera Pant from Loft is actually a crop pant, however, when you're short like me, you can wear them year-round as regular pants (I'm wearing a red pair today!). They are all on super sale right now (40% off clearance) and final sale, so you have to find them when they are in season (spring and summer). But seriously, best. pants. ever. They have the full panel, and unlike jeans, they have fit and stayed in place since day 1. I've been wearing my current pair since I was around 11 weeks. I'm normally a 12 in these pants and I wear a 12 in the maternity ones as well. My favorite part about them is the fabric. It's a thicker woven material that also has some stretch, so it's very flattering. If you can find these babies while you're pregnant, they are worth the money! Those are my main maternity purchases. I will say that I do think it's helpful to have a belly band handy. I hate mine, but other than the times I've tried to make it work, I've worn it once to make a suit work for interviews at work. It's a nice option. The main thing to remember about maternity clothes is that they make you look pregnant. That's their job. Which is super helpful in that "is she pregnant or did she eat too much Cookout?" phase. However, it's not helpful once you've given birth. 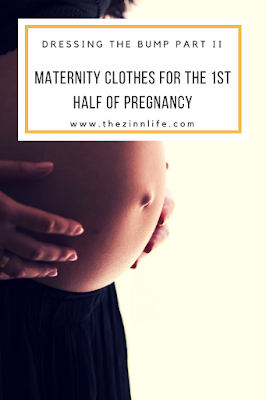 My goal is to buy as few maternity pieces as possible while still having good options. I want to feel pretty and attractive and put together, but I also don't want to spend a fortune on pieces that I'll wear for a few months. I've done a lot of sale and consignment shopping and on Poshmark. Old Navy and Gap have some great basic pieces, jeans and workout wear (once you need it) with awesome sales. Motherhood has some cute options too, but try to find their sales! Mostly, buy what makes you feel good and be smart about it. Comfort and not going broke are the most important parts!